Why Should I Track My Spending? You are here: Home » Spense Blog » Uncategorized » Why Should I Track My Spending? “Why should I track my spending?” I get that question all the time! Whenever I take my phone out to enter a transaction when I’m out with friends, I always get comments. “I don’t want to know how much I’m spending” or “My husband would kill me if he knew everything I spent!”. So why do I want to know? After the month was up, we looked back at our spending and we were amazed. We spent so much money on dining out!! I had no idea that we were spending that much money. We decided to use the “budget tracker” that Craig developed and keep tracking our spending. Pretty soon it became a habit. As soon as I finished a transaction, I entered it into my phone. I came to depend on seeing the balance and knowing exactly how much we had left to spend. Experts agree that recognizing spending habits and trends is necessary to spending less than you earn and to staying on track towards your savings goals. By tracking your spending, you can look back to see exactly where your money is going. This is key to making smarter financial decisions. Families need to work together to make a concerted effort to track their spending and to be honest with one another about their spending. Spending more than you earn, leading to overdrafts and credit card fees, can do irreparable damage to your financial health. When we decided to develop Spense to help track our spending, we wanted to include a balance so that we would always know how much we have left to spend. We decided how much we wanted to keep our spending below for our two week cycle, and then have every transaction come out of that amount. The updated balance on the home screen allows us to know exactly how successful we are being at staying under our spending target. This knowledge is imperative to making smart financial decisions. Several times I have decided to stop tracking my spending for a month or so to see how I did. I was shocked at the difference in our spending when I didn’t enter my transactions into Spense! Before we started tracking our spending, we were close to overdrawing our account each pay period. When I stopped tracking my spending, we went immediately back to our old habits. It didn’t feel good! I tried to keep a running balance in my head of what I had spent, but it was nowhere near the correct amount. The financial decisions I was making were not smart, and were damaging our ability to save money and work towards our financial goals. When I don’t track my spending and keep an eye on my balance, I feel blind. It makes every transaction stressful. “Will it go through? Do I have enough money in my account to cover this?” When I use Spense to track my expenses, I know exactly how much is in my spending target, and the stress is removed. No more worrying, and I know instantly if I can afford to go out to dinner, or if I should wait until the next spending cycle. 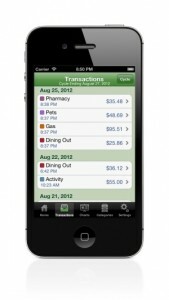 Tracking your expenses puts you in control of your finances. You know instantly what you are spending, and you know instantly how much you have left to spend. Isn’t that better than wondering?